Previously, New Orleans Saints defensive coordinator Rob Ryan had a lot of fun at Mardi Gras despite rainy conditions. 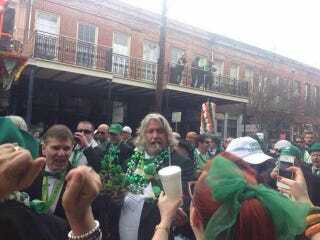 Today's weather is better for St. Patrick's Day celebrations, and Rob Ryan is having a grand old time. Ryan's dressed to the nines and accessorizing with beads, carrying around a beer and cigar as he saunters around New Orleans. Is any part of Rob Ryan actually Irish? It doesn't matter. He is the king of NOLA.